Sebaceous cysts can develop anywhere on the face or the body and are often a nuisance. Cysts are formed when a pocket of tissue becomes filled with pus or other material, which creates a lump or bump. This can be soft and malleable or quite hard. Cysts are often caused by a localised issue with the skin such as infection, in-growing hair, foreign body, or clogging sebaceous glands. 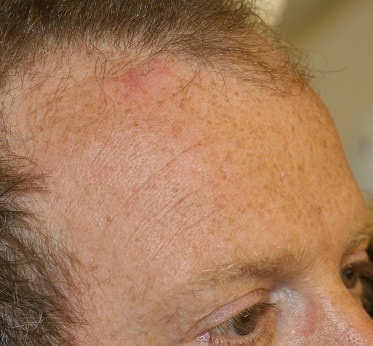 A ‘lipoma’ is similar in appearance, but tends to be a fatty lump deeper in the skin. The lumps themselves are often harmless but if they continue to grow the risk of rupture or infection causes greater scarring later on and they are more difficult to remove. For most patients their GP is the first port of call. Unfortunately the NHS deems that these types of cysts as ‘cosmetic’ and not a ‘medical’ concern, so there is often no treatment available on the NHS. Cyst removal is generally very quick, easy and painless. 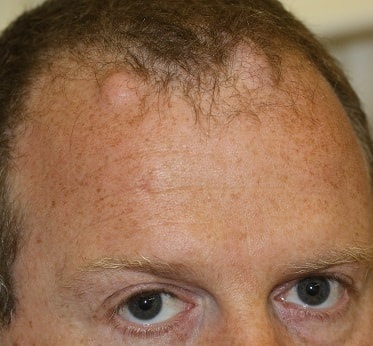 At the London Mole Removal Centre, Dr Ross Perry and his team have revolutionised cyst removal surgery with ‘The Short Scar Technique’ for the majority of patients with cysts. This leaves a scar of just a few millimetres versus conventional methods that make much larger wounds. This means that the scarring is minimised and patients agree that the tiny scar is far more preferable than the appearance of the cyst. Cyst removal is generally done as a precaution against the problem getting worse or for aesthetic reasons. Occasionally, we remove cysts which are already swollen or infected, which brings immediate relief for the patient. As most skin cysts are not medically worrying, it is a question for the patient to decide whether it’s worth it. However, most of our patients are very glad they went ahead. What does cyst or lipoma removal cost? Prices for cyst removal depend on the size, location and complexity of the cyst. Contact us for an appointment on 020 7731 3791 or fill in the form.